…when it is time to say goodbye. My 88 year old mother died on December 1. The day after I visited her, made her a milk shake, read her mail to her, stopped to just say “hi” like I did on many Saturdays. I thought I would see her again on Monday when I was off the island again to get a haircut, have another lunch with her and her friends at the table, tell her about the progress I was making getting ready for the weekend craft fair coming up. Mom had become quite physically compromised in the last year, and her loss of independence could really frustrate her. Yet, she didn’t let it bother her for long. Even on her bad days she still managed to have a smile, delight in a piece of chocolate or two, and enjoy hearing about what was going on in the rest of the world. At quiet times we would look out on the incredible view of Frenchman’s Bay from her apartment window, where we could watch white caps build up on the water if it was windy, and enjoy the constantly changing blues and greens of the ocean. When I got the call on Sunday morning, it seemed so sudden, yet so gentle. She had died in her sleep, just as I had hoped and prayed she would when her time came. No scary hospital drama. No teary clinging. And nothing left unsaid. Our last words to each other were, “I love you!” said breezily because we planned on seeing each other again in just a few days. My mother was a fiercely independent woman. The fact that she was born with cerebral palsy was not a handicap to her. A challenge, maybe, but one she embodied with intellect, style and grace. She told me once, that she never felt sorry for herself, because she really had no knowledge of what life would be like living in a body that had the physical abilities she lacked. When she was in second grade she was encouraged to use a typewriter in school so she wouldn’t be held back by the physical challenges of handwriting. To this day I am amazed and grateful for the forward thinking of her parents, who moved from Rochester to Fredonia, New York, in the early 1930’s, so Mom could attend an elementary school that was affiliated with a teacher’s college. Had they stayed in Rochester, where at the time, children with physical handicaps were combined with children who had mental handicaps to be “schooled” in an institution, we all would not be here today sharing memories of the amazing woman who has had such an influence in my life. 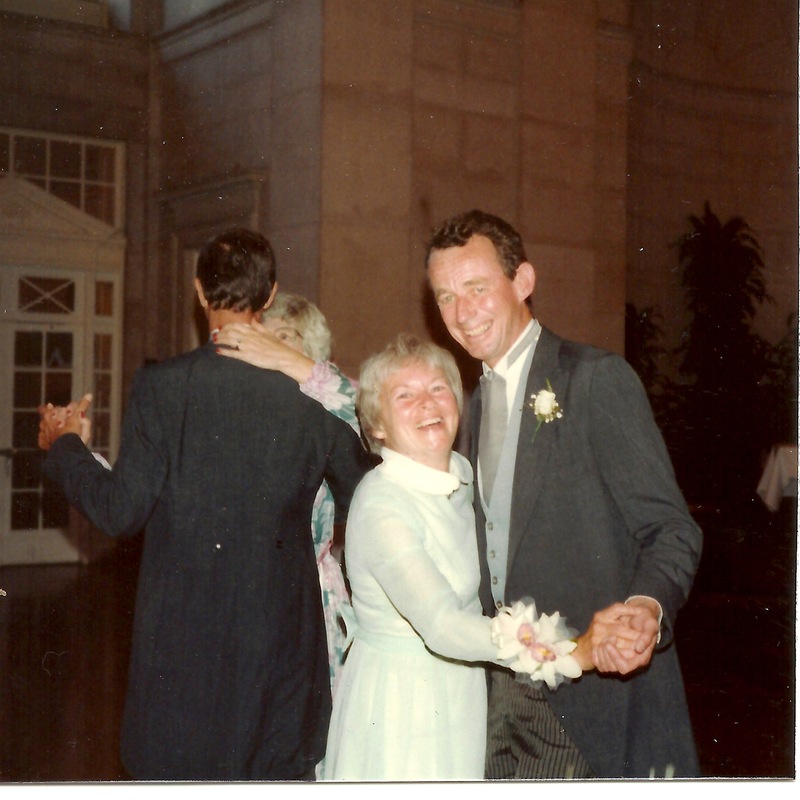 There is no question that Mom could and did enjoy life like everyone else. She just needed time to think things through and find her own way to achieve the same results as others. It is human nature to think our own way of doing things is the best, but Mom’s way was usually how we did things. Her family nickname was, “The Cruise Director.” She earned it and she was good at it, even though there could be times when it grated on us. She was an excellent driver, having fought a little harder than the rest of us for the right to take a driver’s test. Right from the start, Mom figured out that it saved time and gas and was much safer to plan out all of her errands using right hand turns, avoiding left hand turns as much as possible. Over 50 years later, UPS would make this a policy for their drivers, saving time, money, and promoting driver safety. She was way ahead of her time on many things. For one segment of her 2,000 hours as a volunteer for Highland Hospital in Rochester, N.Y. she was a buyer and manager of the hospital gift shop. She was expected to keep the cigarette machine stocked. At this time in her life, she and my father had already quit their own smoking habit and she felt it was an ethical dilemma to make cigarettes available to doctors who were telling their patients to stop smoking. She petitioned to have the machines removed from the hospital, much to the dismay of the hospital board. She had to fight to get her way, but eventually she did. With the beginning of the environmental movement in the 1960’s, Mom had her family trained to cut the tops and bottom off cans and flatten them for recycling. She faithfully took bottles, cans, newspapers, and cardboard to the new town recycling center, before I had ever heard of anyone else’s parents doing this. 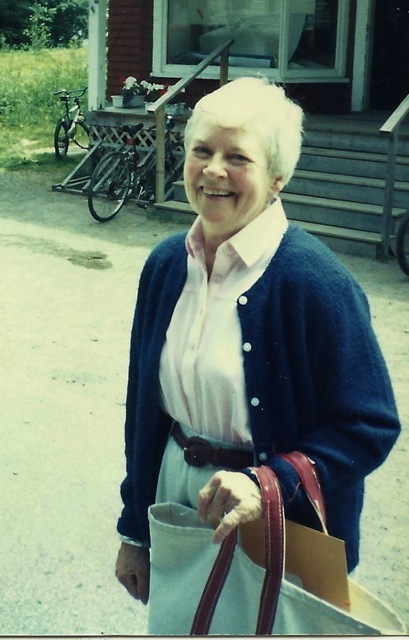 She was an avid skier, going without ski poles so they wouldn’t trip her up, a technique that eventually became useful in teaching young children to ski. She also had “shortie” skis that were easier for her to maneuver, years before they would become a popular commercial option. I learned a lot from my mother, but some of the most lasting lessons came to me when she was not actively “directing the cruise.” At age 10, my friend Linda and I wanted to make chocolate chip cookies. “Here’s the bag, the directions are on the back,” said Mom. She was nearby in the kitchen, as Linda and I put all of the ingredients into one bowl, neglecting to read the part about creaming the butter and sugar, adding the eggs and then adding the flour and chips at the end. The cookies were a disappointing mess. Mom didn’t criticize or say anything more than, “Oh, maybe you forgot to read the directions all the way through first.” A life lesson learned in one shot. I watched Mom learn to arrange flowers from a class taken with her friend Marianne Woodams. I think of her every single time I put flowers in a vase. She was good at it and showed me how to do it by her example. I learned to identify birds and carry a bird book as a result of watching her own interest in birds. Her love of unusual jewelry, much of it influenced by the Arts and Crafts tradition, probably had the most profound impact on my life. I always had access to her jewelry drawers, and from a young age she let me borrow pins to wear to school, trusting me to still have them firmly attached when I returned home. In our house, any craft activity was encouraged. Trips to Mr. Minor’s craft shop on University Avenue always took precedence over buying toys at places like Neisner’s and Woolworth. After a childhood like that it is no surprise that I’m very satisfied to have ended up with a career in jewelry design. Thank you Mom. Thank you for your love of sweaters, for teaching me about cashmere, for your amazing sense of color and design, for your incredible ability to laugh at and lighten awkward moments, for taking us to hockey games, for the endless drills in grammar that taught us when to use “me” and when to use “I,” for making sure I never used the word “irregardless” because it isn’t a word, (though it has been so commonly misused that it now is a word! ), and for teaching me that “some of each” is correct and “some of both” is not. Thank you for your tremendous strength and amazing calm in helping Dad through his dying process, and for finding the courage to travel, learn about stocks and bonds, and take on so many activities as an independent widow. You lived a full life, on your own terms. A true example of strength. Wow. I really like your mom! What a blessing to have been raised by such a force of nature. It sounds like she was quite a fascinating woman and lived a rich, full life. I’m sure you will miss her deeply. Thank you Ginger. There were times when it wasn’t easy to be her daughter, but there really was so much to admire about her. She had quite the spirit! Beautiful sentiments Barb. Again, I am so sorry for your loss. But you are so blessed that she went in her sleep. I think it is everyone’s wish in life that hospitals are not needed when it comes time. I love the driving story about the right turns! I can’t imagine having to think about that while driving! I wish you all the peace you can find this season. It is never easy to lose a loved one but in this season it becomes even harder if that is possible. Love to you. Thanks Roberta. She really did teach me to drive in all right turns! It still saves time when trying to fit in all the errands between boat schedules! She loved this season. Thanks Al. I’m really looking forward to seeing you guys this weekend. The only comment I have to make is that making jewelry always matters. It’s part of who you are and how you think and see the world, and make other people happy. Art is how we relate to friends and strangers and how we find peace. Selling? Who cares? I think of your Dad’s and Mom’s projects, well away from his job and her raising children and grandchildren. They were delighted and proud in that work. I know that your Mother was always delighted in you. Your stories written or spoken these last years have shown me that you both took pleasure in these conversations. I know how hard it was getting up to go off to see your Mom. You went out of love, passion, and a desire to do things right, that all of you Shirey’s have. It’s in the blood. And in your blood is also art. Use it. It can be a great friend. ps: we’re back on the island tomorrow. Thank you Henry. Welcome back. I actually spent some time in the studio yesterday and it was quite comforting. I’m glad we all got to have lunch together at the Jordan Pond House a few years ago. And that you got to meet her. Beautiful. What a fascinating person your mother was. I will be thinking of you. Thanks Jackie. Now I’ll actually get into Ellsworth instead of just going between Bar Harbor and Northeast on my days off the island. I’ll stop by. What days are you in the studio? Nice tribute, Barb. I’m glad your last words to each other were “I love you.” What a great way to go out. And amen to the right-hand turns. Smart lady. Definitely a smart lady! And, yes, a total comfort to know that we each said, “I love you,” as our last words. Especially since we didn’t know they would be our last words to each other. What a beautiful tribute you have written here – I have tears running down my face! We had an ice storm here and lost power early this morning – it just came on after almost 12 hours and the first thing I did was come to your blog. I am so very terribly sorry for your loss, yet I am so happy she had such an amazing impact on you and others. Keeping you and your family in my prayers. Thank you Patti. I have such admiration for you having your mom live with you! I was able to spend a little time in the studio yesterday and there really was solace there. Trying to get things in the mail today to send to Archipelago…well I managed it. But, it was rough. Good days and bad to be expected. Beautiful tribute to your mom, Barb, and I loved getting to know more about you and her! I’ve been thinking about you guys, and Jason’s father passing at the same time. So weird we were each at funerals on Saturday, eh? ((Barbara)) I don’t think that I can add anything to what everyone else has said. Hold those memories close forever. So beautiful, Barb. What a thoughtful loving tribute. How lucky you both were and how lucky you are to have a mom like that. My mom passed when I was 20 and I so wish she were in my family’s lives right now. I wonder what she would have thought of my sons, my photography, remodeling an old farmhouse. Thanks Lisa. It must be especially hard to not have your Mom here to enjoy her grandsons. We were lucky. Your jewelry should arrive in Rockland tomorrow for the last minute shoppers.